Nanjing South Railway Station, which serves high speed trains only, is 6 miles (10 kilometers) from the Xinjiekou area in city center, 4.5 miles (7.5 kilometers) from famous Confucius Temple, 10 miles (16 kilometers) from Nanjing Railway Station, and 18 miles (29 kilometers) from Nanjing Lukou International Airport. Nanjing South Train Station offers bullet trains to and from Beijing, Shanghai, Suzhou, Hangzhou, Guangzhou, Wuxi, Changsha, Xi'an, and Xiamen, etc. The above schedule is for reference only. 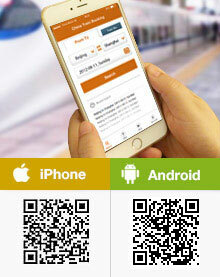 For real-time schedule and ticket booking, please click the arrival stations. The station includes a terminal building, a North Square and a South Square. It is a comprehensive transportation hub, providing railway, metro, bus, taxi, inter-city coach, and airport shuttle bus services. It consists of 5 floors in total, including 2 basement floors. Passengers can enter and exit from either north or south side of the terminal building. Outside the terminal building, there is a passage on west side used by public transport including city buses, airport shuttle buses, long-distance buses and taxis. Passengers can follow the signs and guidance to get there. Bus: There are two bus stops. One is called "South Long-distance Bus Center" which offers Express Buses to Lishui City. The other one is named "Nanjing South Train Station"; city buses No. 19, 27, 84, 129, 190, 719, 791, 792, d12, d16, Night Bus No. y16 and Night Bus No. y27 are in service there. Long-distance Bus: The South Long-distance Bus Center offers buses to many other cities in Jiangsu Province including Lishui, Gaochun, Wujiang, Changshu, and Suzhou. Taxi: There is a taxi pick up area on the B1 floor in west passage. Taxi here usually heads to downtown area. There is also a taxi pick up stand in the passage which located on the east side of the terminal building, on the first floor. Taxi goes to both Jiangning area and downtown area. Metro entrances/exits and parking lots can be found on North Square. There is also a city bus station named South Station North Square set up there for bus No. 116. The square will be fully completed in around July, 2017. At that time, the South Square will also be equipped with metro entrances/exits, parking lots and facilities for commercial use. To Confucius Temple (Fuzimiao): Travelers can take metro line 3 directly. The metro duration would be around 25 minutes. Taking a taxi would be around 20 to 25 minutes and the taxi fare is about CNY25. To Dr. Sun Yat- sen's Mausoleum & Xiaoling Mausoleum of Ming Dynasty: These two destinations are not far from each other. Travelers can take metro line 3 to Daxinggong first and then take line 2 to Muxuyuan, get out via No. 3 exit. From there, travelers can walk to both destinations. The metro ride would take around 40 minutes. By bus, passengers can take bus No. 84 to Weigang, the 24th stop and then walk there. The bus would take about 1 hour. Taking a taxi would take about 45 minutes and cost around CNY50. To Nanjing Railway Station: Passengers can take both metro line 1 and line 3 to get there directly. The duration would be around 40 minutes. By taxi, the trip would take about 30 minutes and the taxi fare is about CNY45. To Lukou International Airport: Passengers can take the airport shuttle bus from the long-distance center on the west side of terminal building. The shuttle bus starts at 05:40 from Nanjing South Train Station and end at 21:00 with an interval of 30 minutes. A single trip takes around 40 minutes. From the airport, the bus starts since the arrival of the first flight and ends at 23:30. The ticket price for a one-way ride is CNY20 per person. Passengers can also take metro line S1 (Airport Express). The metro duration would be around 50 minutes. A direct taxi ride would cost around CNY100-120 and the duration would be around 30 minutes without traffic problem. Can I buy Nanjing transport smart card (Jinlingtong) at Nanjing South Railway metro station? Vending machine in metro sell the card? I read somewhere that the card can be recharged in South Station by using vending machine, but no service for card sales. How does one call/catch a taxi off the street? Do they use meters? You could flag down one directly, they will charge you by miles and time. upto night which time we can buy fast train ticket? You can buy the ticket at any time before departure at the station. Usually it would be better to get there in advnace in case there is a long waiting for the ticket and security check etc. Yes, you can take the subway S1 to the airport directly, CNY6 or 7 per person.